If the work you do on your laptop requires different sets of apps, you’ll be glad to hear that you can create different desktops. For example, you might want one desktop containing financial apps and calculators, and another that contains the Music app, an online radio app, and iTunes. To create multiple desktops, click the Task View button and then click the + button in the lower-right corner of the Task View. 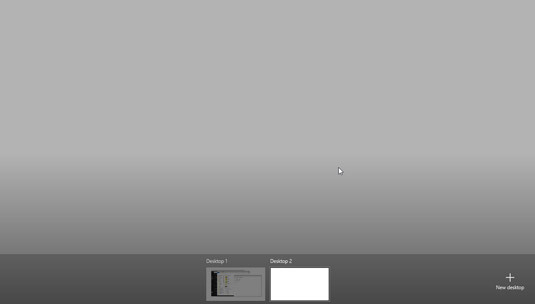 In the resulting window, you see thumbnails on the bottom of the window representing each Desktop. 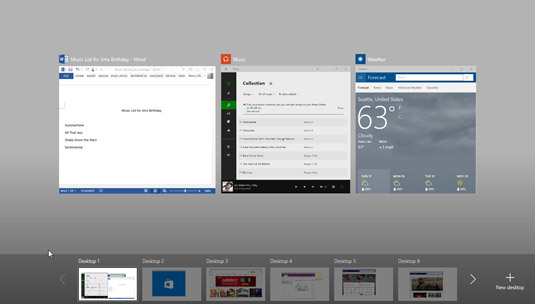 Click the desktop you just created and then open the apps you want to appear in the new Desktop. To return to another Desktop, click the Task View button and then click the desired Desktop button. Task View displays a button for each Desktop you create. If there are more than six desktops, you can use right and left arrows to scroll through the Desktop thumbnails until you find the desktop you want. If you want to close a Desktop, hover over the thumbnail of the Desktop you want to close, and then click the Close button that appears.